Psalm 119 Scripture Wall decal quote. 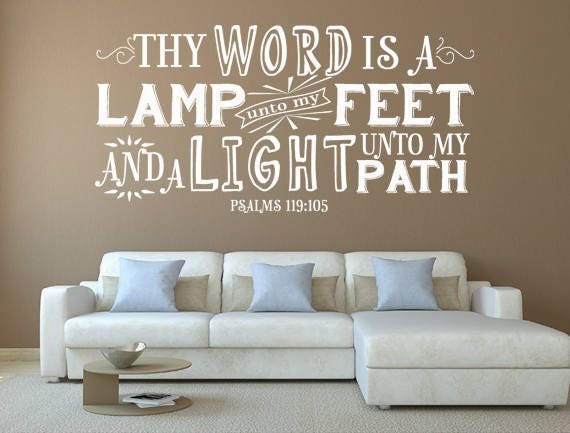 This is a beautiful and original wall decal that reflects the King James Version Scripture verse found in Psalm 119 that will add a touch of inspiration to any room in your home!! Our eye catching wall decal is easy to apply and looks hand painted. Removable but not reusable. Please note the size of this listing as the picture may not show the size to scale. This decal measures approximately 36 inches wide by 18 inches in height. This decal is fully customizeable. Please contact us regarding any customization questions. You can choose a color from our available selection when you check out. ♥ Our decals can be applied to most clean, smooth, hard and flat surfaces. Textured surfaces are not recommended. ♥ PLEASE BE ADVISED that vinyl wall decals do not adhere to walls painted with “zero VOC” or “VOC free” paint. It is not recommended that you apply our vinyl wall decals to walls that have been painted with this new, eco-friendly paint. Beautiful work!! Very creative. Shipped in a timely manner.